The 26-year-old limped off after just 20 minutes of Barcelona's 4-1 win over Real Betis on Sunday and was replaced by Andres Iniesta. It was the third time this season that he has been forced off with a muscular problem following hamstring and thigh injuries in his right leg. "The club's medical services confirmed after tests this Monday morning that Leo Messi has a torn hamstring muscle in his left thigh and is expected to miss the next 6 to 8 weeks," Barcelona said in a statement. 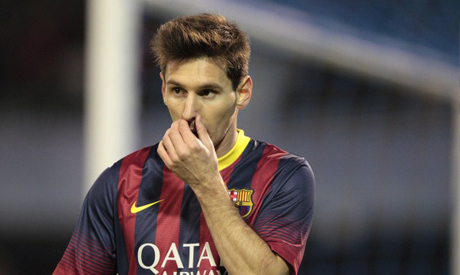 "The first phase of Messi's recovery will be covered in Barcelona and he will then travel to Buenos Aires," it added. After Sunday's match Barcelona boss Gerardo Martino said Messi's injury troubles were not related and the absence of the four-time World Player of the Year could never be used as en excuse for the team to not perform. "We have the best player in the world, but we also have four or five of the next six or seven best players in the world. Therefore, as a coach, the absence of Messi should never be used as an excuse for not winning. "The injury to Messi doesn’t have anything to do with the previous ones because it is in the other leg. "We also need to speak with Leo, it is the third episode he has had in a short time so it is obviously playing on his mind." Messi suffered a bruised thigh during the first leg od the Spanish Super Cup against Atletico Madrid which kept him out for a week. He then suffered a small muscle tear in his right thigh during a La Liga match against Almeria on September 28 which sidelined him for three weeks. Last week Messi said on Chinese social networking site Weibo at the weekend he was still not fully fit. "Physically I am still not at 100 percent but I am confident that as I play more matches I will recover my rhythm," he said. Despite losing Messi with the score still at 0-0, Barcelona cruised to victory as two goals in two minutes from Neymar and Pedro Rodriguez put them 2-0 up at the break and Cesc Fabregas struck twice after the interval. The win left Barcelona with 37 points from 13 games, ahead of second-placed Atletico Madrid. Fabregas said he understood Messi's frustration, but that it was possibly best for his teammate to sit out a couple of weeks to recover his best form. "Messi needs to be explosive to stand out and he needs to stop for as long as it requires to be ok," the midfielder said after Sunday's match. "The same thing has happened to me in the past and it is very frustrating." Fabregas also limped off after appearing to injure his knee whilst scoring his second of the night. The club said Monday he has a sprained knee ligament and will need roughly one week to recover.